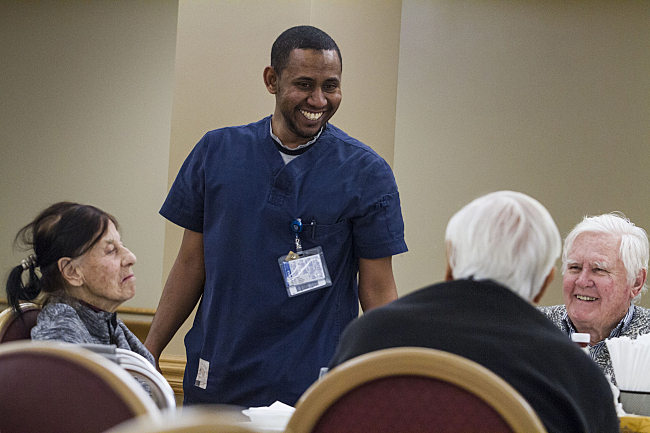 For three years, Abdelsalam Elshaikh has worked as nursing assistant at Charter House, a Mayo Clinic retirement community that houses a short-term rehabilitation center. 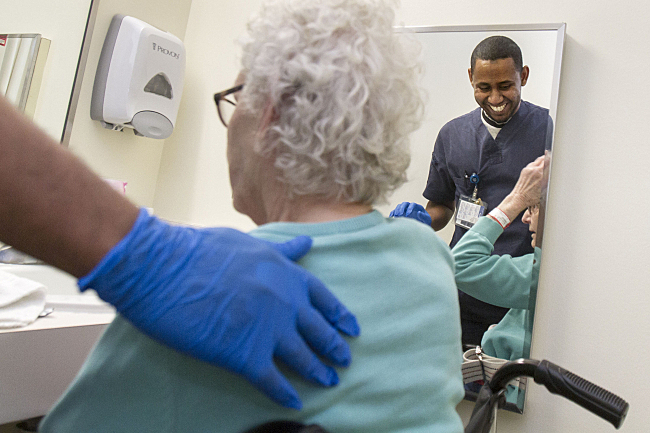 Every night, his duties include wheeling patients recovering from hip and knee surgery to the dining room. Elshaikh, a medical school graduate from Sudan, longs to do the kind of work he spent years preparing for. But as a foreign-trained doctor, he must overcome a complicated, lengthy and expensive process that could take him years to finish. Minnesota may become a national leader in helping foreign-trained physicians to practice in the United States. Proposed strategies include dedicating spaces for those doctors in medical residency programs. The state Task Force on Foreign-Trained Physicians estimates Minnesota is home to as many as 400 immigrant physicians who have not yet been certified to practice, though social service providers say that number is probably higher. Many are doing other work, such as taking supporting roles in health care, serving as interpreters or driving cabs. Elshaikh, 30, is determined to beat the odds. After graduating from medical school in 2008, Elshaikh decided he wanted to practice medicine in the United States — even if it meant he would have to retake many of the same steps. As a doctor in his homeland, he would see many patients with malaria and tuberculosis. But he wanted to practice a fuller range of medicine. Elshaikh applied for a visa through the U.S. State Department’s Diversity Immigrant Visa Program, which each year grants about 50,000 visas to people from countries with historically low rates of immigration to the United States. To earn the right to practice in the United States, foreign-trained doctors must pass the first two parts of the United States Medical Licensing Exam, be certified by the Educational Commission for Foreign Trained Medical Graduates, enter a residency program and pass the third licensing test. The process is long, so Elshaikh began his medical residency in his homeland and waited. In 2010, after winning one of the coveted visas, Elshaikh moved to Sarasota, Florida to be near his sister and started over — this time, as a nursing school student. A couple years later, he moved to Minnesota. At Charter House, Elshaikh works the night shift so he can study during the day. He received $3,000 in state grants from Workforce Development Inc. to help pay for the exams. The high cost of exams is one of the biggest challenges immigrant physicians face when trying to practice in the United States, said Jinny Reitman, Rochester area manager for Workforce Development. Another is being accepted into medical residency programs. It costs $7,500 to $15,000 for a foreign-trained physician to prepare for and pay for exams leading up to a residency, fees that residents typically pay themselves, according to the task force’s recent report. According to the Minnesota Department of Health, about 14 percent of Minnesota’s physicians are people of color, but African-Americans and Latinos are under represented, as are members of most of Minnesota’s largest refugee and immigrant communities. There are also persistent health disparities between whites and people of color in the state. Reitmann said adding more immigrant physicians would help tackle the health disparities between white residents and minorities in more effective ways. The legislative task force is calling for ways to streamline the process to help more foreign-trained doctors practice in the United States. Among the legislative task force’s recommendations is for the state to develop a standardized assessment and certification program to measure the clinical readiness of immigrant physicians, as well as dedicating residency positions for immigrant physicians, according to Barbara Porter, Mayo Clinic’s College of Medicine Administrator, who served on the task force. Elshaikh has passed the first two parts of the medical exams and will take the third in late March. If he clears that hurdle, his next step will be to apply to residency programs around the country. He hopes his experience at Mayo Clinic will give him the edge he needs to get into one the programs.